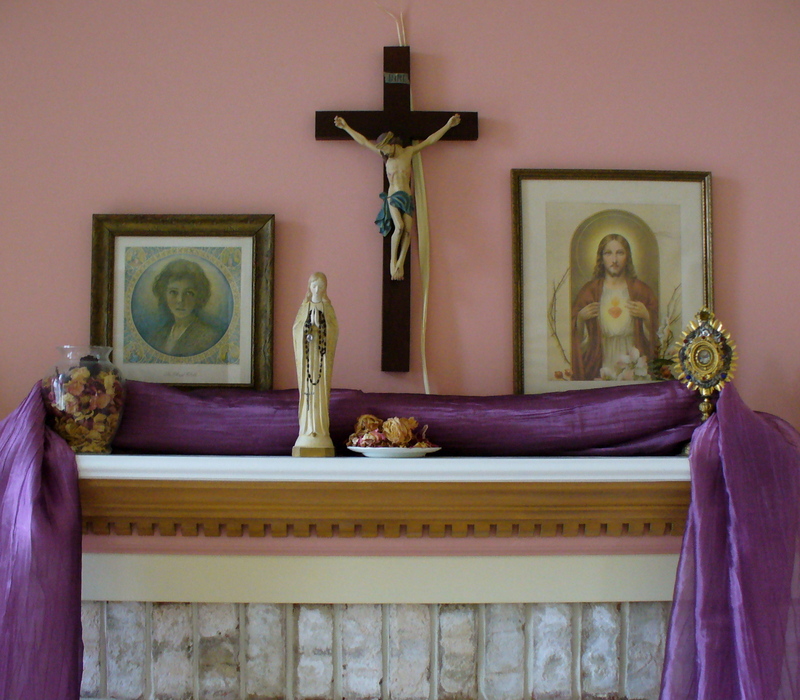 Lent is here, and The Joyful Hermit is changing the decor: simply, slightly, inexpensively. Although many do not sense it, we humans are innately tuned to the spiritual seasons of God: Advent, Christmas, Lent, Easter, Pentecost, and Ordinary Time. Years ago Joyful Hermit came upon some purple place settings. These are used each Advent (four weeks prior to Christmas) and Lent (40 days before Easter). A place-setting of 8 was around $100 then, and these dishes have paid for themselves many times over an equal use of paper plates. Someday these will be passed on to family or sold in the estate perhaps for more than the initial investment. 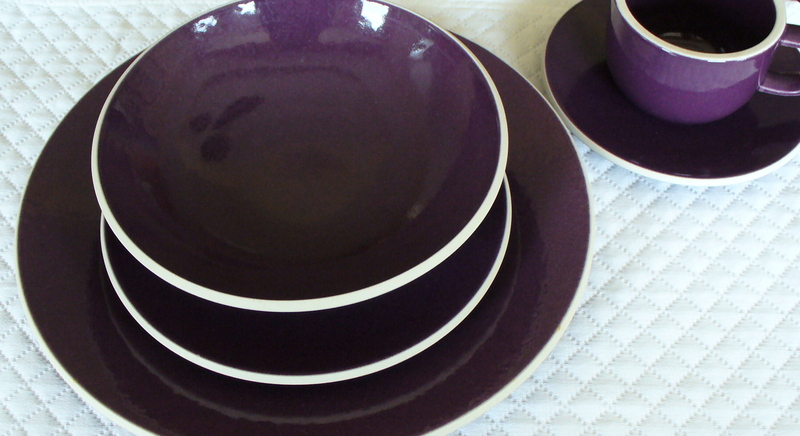 But if purple dishes or storage of them is not available, finding purple fabric is easily accomplished. 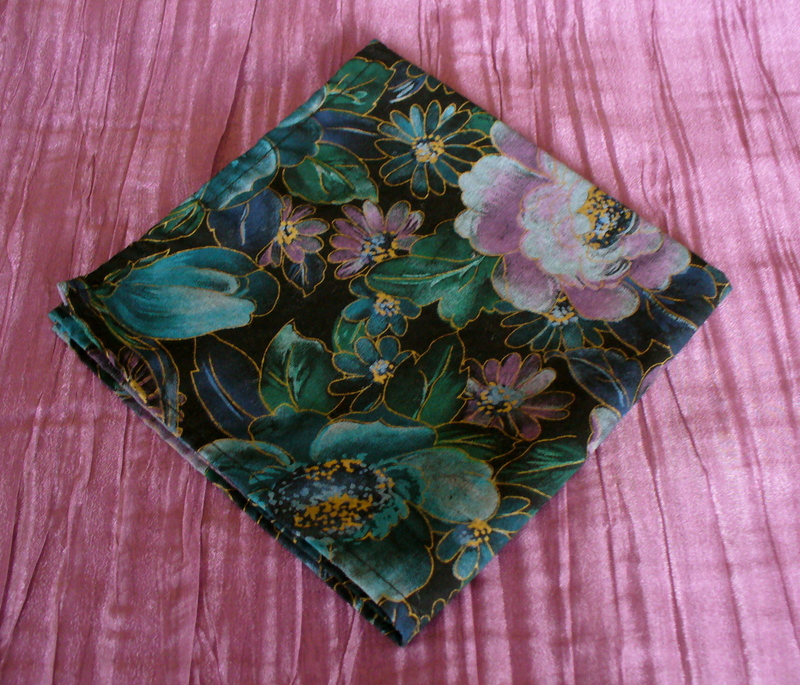 Joyful purchased 2 yards of cotton, floral, Advent-Lent colors in fabric at a dollar store, total $4. Cut and hemmed (have machine but could do by hand), the result is 8 luncheon napkins and a narrow table runner. The sheer mauve [pictured] can be used as table covering over black or white under cloth. Or, it can be draped above a window, mantle, wall decor or however the imagination desires. JH purchased 3 yards @ $1 per yard in Walmart. Fabric is easily washed, stored and re-used year after year. If your drawers and closets are full, lay fabric flat under sofa cushions or mattress since they are only used in these two seasons. You may have figured out, in reading posts by a [joyful] hermit, that many hermits are religious types. Historically, hermits evolved as religious solitaries to devote all to God. 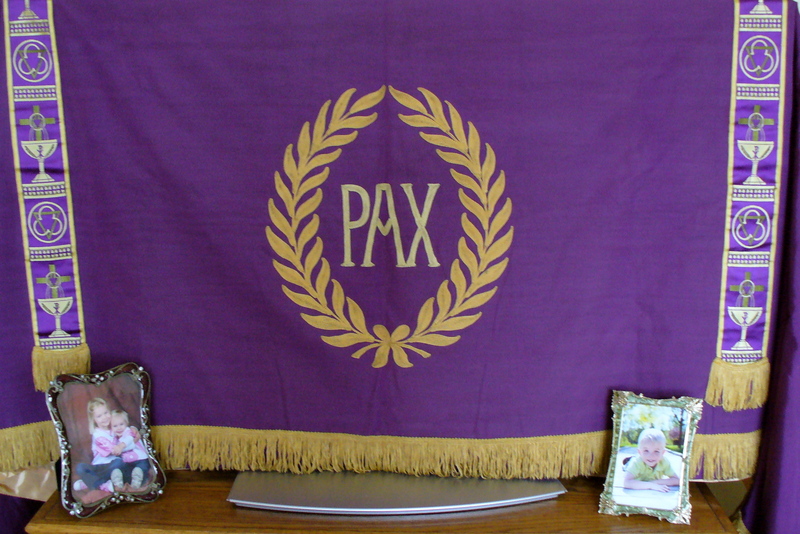 Thus, JH received a gift of four altar frontispiece cloths (purple, gold, red, white) from a church that had purchased new ones. These have served beautifully in the hermitage to cover the flat screen TV which is rarely used. Any sewn or glued banner or draped fabric would be lovely over any such furnishing. Joyful finds the cloth reminder better than a black, reflecting screen, and it keeps dust off the TV. This entry was posted in Cost Savers, Living Holy. Bookmark the permalink.